People often refer to New Orleans as “The Big Easy” because of the laid back, easygoing attitude of most of the people in the city. That’s also one of many good reasons to cruise out of the Port of New Orleans. Located near the mouth of the Mississippi River, the New Orleans port complex is one of the busiest in the world. The area is both a popular trade point and a cruise departure port for ships into the Caribbean, across the Atlantic, and up the Mississippi River. 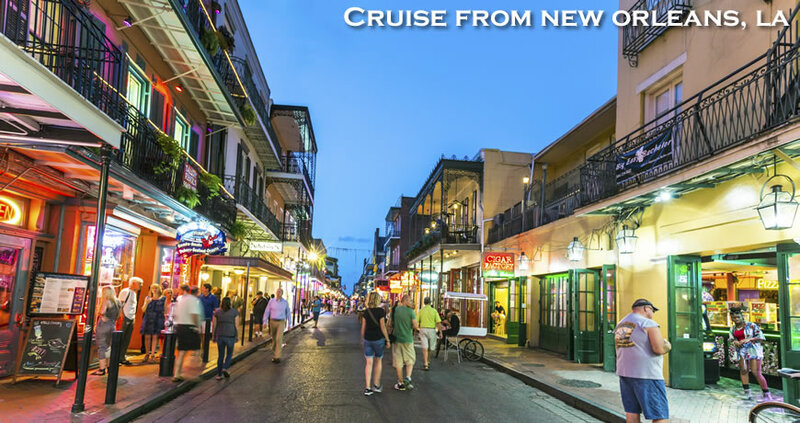 In fact, about 700,000 passengers pass through the New Orleans cruise port yearly! The port, as well, has the world’s longest wharf, capable of holding up to 15 vessels at once. 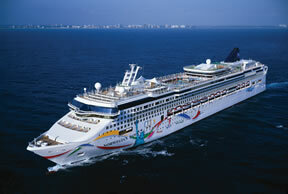 Cruises departing from New Orleans include multiple lines such as Carnival and Norwegian Cruise Line. The Louis Armstrong International Airport (MSY) is approximately 17 miles from the cruise terminal complex. Allow approximately 45 minutes travel time. Shared shuttle service to the pier is $13 per person and can be arranged at the kiosk located in the baggage area of the airport. Taxis are always lined up outside and charge a flat fee of $28 for the first two persons, $12 per person for three or more. The Julia Street Cruise Terminal Complex building includes a four level, 1,000 car garage that offers the passenger convenient covered parking in a fully secure environment. Parking cost $14 per day, cash or credit card. Porters greet the passenger on the first floor of parking and check their luggage before parking. After parking, the passengers take the central elevators direct to the second floor embarkation deck to check in and board the cruise ship. The French Quarter: Occupying the same six by thirteen block area laid out in 1722, it’s the only intact French Colonial and Spanish settlement remaining in the United States. 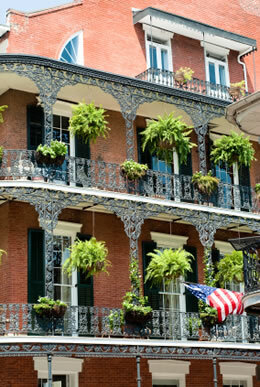 Walk down Bourbon Street lined with numerous bars, jazz clubs. 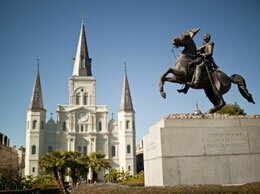 Linger in Jackson Square, (a statue of General Andrew Jackson stands in the center of the square), and marvel at its historic buildings; the St. Louis Cathedral, the oldest continuously active cathedral in the United States and The Cabildo, site of the signing of the Louisiana Purchase. 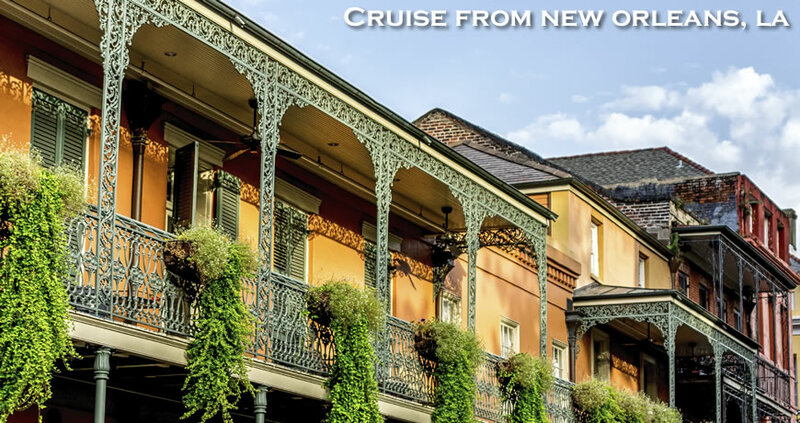 From the beautiful architecture to art galleries, museums, and restaurants, the French Quarter has something for everyone. Plantation Tours: One excellent one to consider is the Houmas House Plantation and Gardens. Enjoy a Grand Southern Mansion surrounded by the South’s most beautiful gardens. Catch a glimpse of the way life was in the early 1800′s when sugar was king and Houmas House was the largest sugar plantation in the world. The Cemeteries: Yes, you read that right. There are dozens of cemeteries throughout the city, but most organized tours will take you through St. Louis Cemetery #1 and Lafayette Cemetery: With a spooky history, unique, ornate tombs, and some of them dating back to the late 1700s, it’s no wonder that travelers are usually eager to explore New Orleans’ famous resting places! Audubon Aquarium & Zoo: This is one of the country’s top-ranked zoos offering an exotic mix of animals from around the globe in natural habitats. At the aquarium, walk beneath the vivid Caribbean Reef, feed a stingray, or become an Adventure Island explorer and journey the Mississippi River. Mardi Gras World: Mardi Gras World is literally the place where Mardi Gras magic is made. Watch the artists of Blaine Kern Studios, the world-renowned masters of Carnival sculpture and float building, at work in their shops. 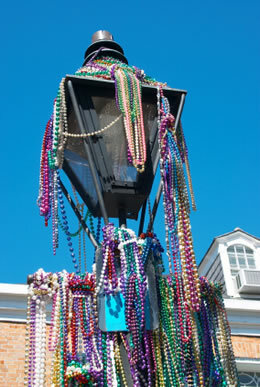 You’ll even have the opportunity to dress up and take pictures among the props and floats! 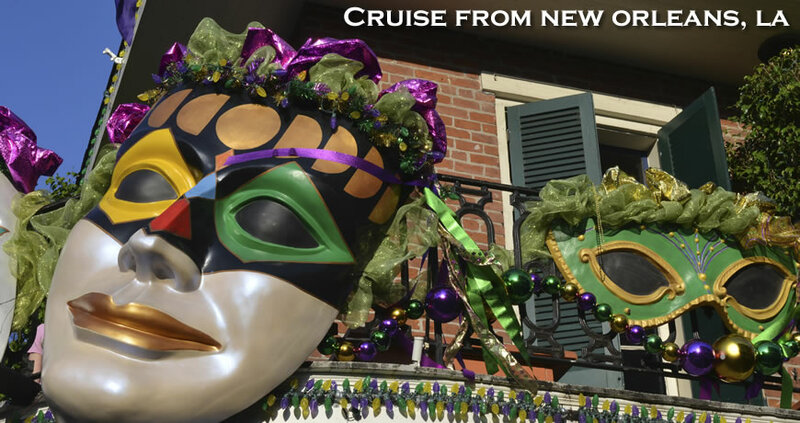 For more information on cruises from New Orleans, call the pros at Direct Line Cruises at 1-800-352-8088. •Stay on I-10 all the way into the city. •Stay left and take the “Business 90 West/Westbank” exit. •Exit 11C “Tchoupitoulas St./South Peters St.” Follow instructions below to Terminal #2 parking Lot. •Stay in one of the left two lanes, under the “Business 90 West / Westbank” sign. •Take the “Business 90 West/Westbank” exit. •After you exit 11C, “Tchoupitoulas St./South Peters St.” Continue straight ahead in the left lane to Convention Center Blvd. •Turn left on Convention Center Blvd. •Continue past two traffic lights and cross the intersection for Julia Street. •Entrance to Parking Lot will be on the right directly after Julia Street. •Parking Facility located directly next to the Hilton New Orleans Riverside Hotel. •Will see giant picture of a Whale on the building adjacent to the Parking Facility.